Bamboo-tube rice has long become a specialty in the cuisine culture of Thai people in the Northwest, a simple dish with the unique flavor of the mountainous areas. 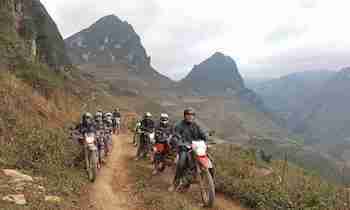 Having a Mai Chau full day tour to admire the majestic mountains and forests, no one does not know bamboo-tube rice, even foreign tourists. If people in plain regions cook rice by rice cookers, the northwestern people cook rice with bamboo shoots. It is a characteristic that nowhere has. 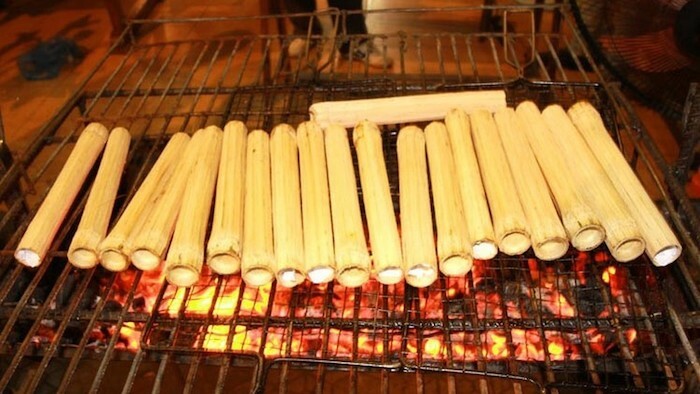 Bamboo-tube rice is the rice (usually sticky rice) cooked with some other ingredients, then put in a bamboo tube and grilled on the fire. 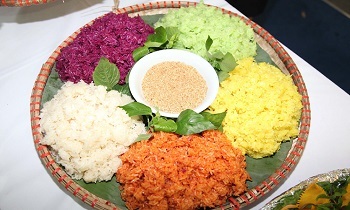 It is the famous rice of ethnic groups in the Northwest of Vietnam, the Central Highlands and some ethnic groups in Laos, Thailand, Cambodia, Myanmar, and China. How to make bamboo-tube rice? To make bamboo-tube rice, you must choose a fresh bamboo tube that is not too young or too old. The most suitable bamboo tubes are from October to January. You bring it back to cut each bamboo section into many parts. The next step is to choose sticky rice. That is a very important step because it determines the plasticity of the rice. If you want to make delicious bamboo-tube rice, you have to choose the right type of sticky rice which is fat, white, and fragrant. 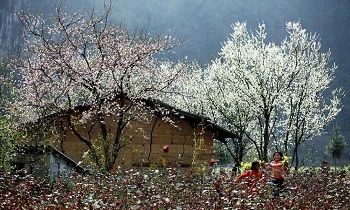 That is the special sticky rice of the Northwest mountains, which grows on terraced rice fields. After that, you wash the rice thoroughly and soak for 5 to 6 hours, pick rice out to drain, then put the rice and pour water into the tube to flood the rice. Do not fill too much rice because when rice is well-done, it will expand to close the mouth of the bamboo tube. Then take the banana leaves or phrynium leaves to cover the mouth of the tube and then grill on fire. 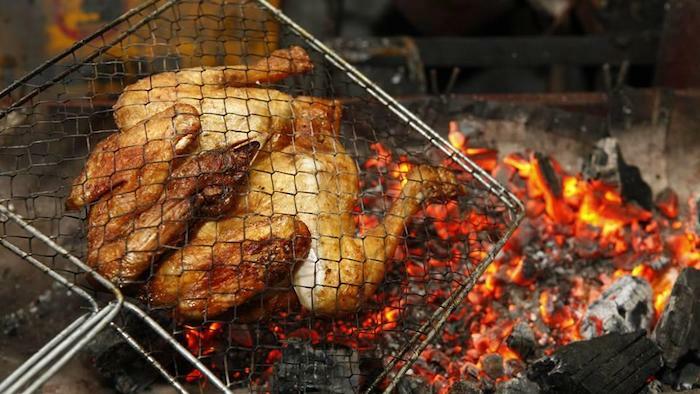 When grilling, it is necessary to rotate the bamboo tube continuously, not to burn it so that the rice is perfect. When there is steam coming out of the mouth and the sweet smell of rice, bamboo-tube rice is well-done. After that, detach the outer shell of the tube to have the thin layer which you can peel easily while eating. Bamboo-tube rice goes well with sesame and salt or "cham cheo" - the unique ingredient of Thai. These two kinds of sauce will contribute to the deliciousness of the rice. 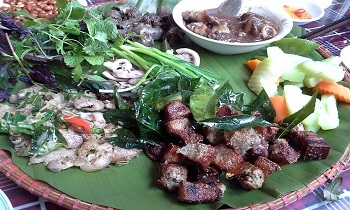 According to the experience of local people in the Northwest, apart from sesame and salt, bamboo-tube rice will bring the best flavor when served with grilled spring fish or wild boar in banana leaves. Bamboo-tube rice of the northwest Thai is a simple dish with the characteristic flavor of the mountains, the harmony between the fragrance of sticky rice and bamboo creating the attractive aftertaste of bamboo-tube rice. Previously, in the living, the Thai people often go to work on the field all day, so they usually bring rice in bamboo tubes. According to them, they can keep the dish for a long time without damaging and losing the fragrance of rice. 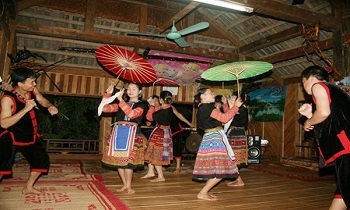 Today, in many festivals of Thai culture, bamboo-tube rice is selected as a gastronomic cuisine to introduce to visitors. Nowadays, bamboo-tube rice is famous all over the country. 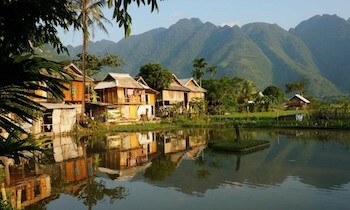 You can see that many people sell bamboo-tube rice at the highland markets where a lot of tourists visit. To serve the visitors' demands, the bamboo-tube rice specialties in the mountains of Northern Vietnam are slightly different. They can add a little coconut milk with small copra mixed with glutinous rice and then put them in the bamboo tube. 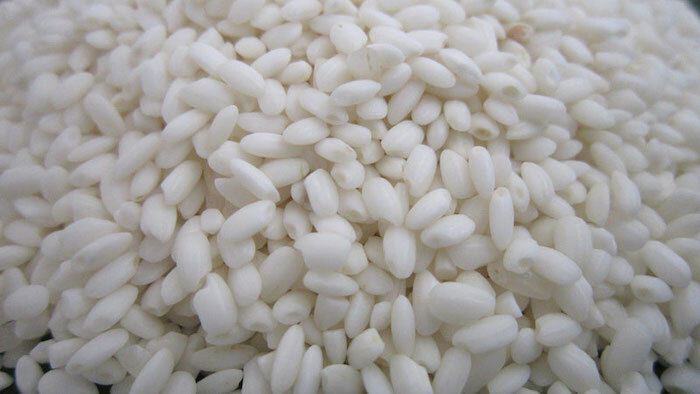 The rice will have the sweetness of the forest, mountain and the fat of coconut milk, which is very delicious. In particular, the local people here also mix glutinous rice with colored water made entirely from the ingredients on the mountain for bamboo-tube rice to have attractive and delicious food. Besides the mountainous specialty of bamboo-tube rice in the North such as Moc Chau, Mai Chau, and Sapa, you can also explore a delicious and rare rice dish. It is similar to the bamboo-tube rice, but it has a preparation with fresh coconut. Sticky rice and green bean are mixed with spices, stuffed into coconut, and put on fire. Today, bamboo-tube rice has become a commodity and also a specialty in restaurants, hotels that are well-known and loved by tourists. Bamboo-tube rice not only is a special dish of Northwest Vietnam in particular but also contributes to the unique Vietnamese cuisine in general. 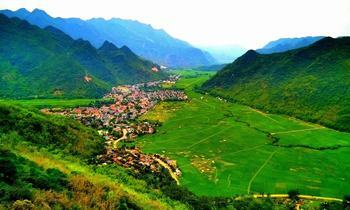 If you love trekking to Mai Chau and enjoy bamboo-tube rice - the Mai Chau’s specialty, feel free to contact us via our website. Share it if it is useful to you. Have a nice trip!